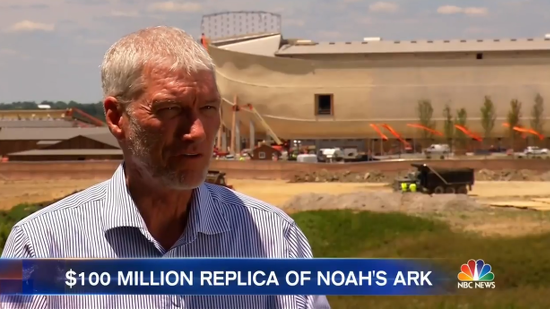 If you missed it yesterday, NBC Nightly News gave Ken Ham‘s Ark Encounter a free two-minute commercial during the show. There wasn’t a single voice of opposition. There wasn’t any mention of how the state government is giving Answers in Genesis up to $18 million in tax breaks. And there wasn’t even a mention of how the whole Noah’s Ark story is fiction. I understand the human interest aspect of the story, but a news program could have spared a few seconds for a sound bite from one of the many, many critics of the attraction — especially considering that we’re the ones in the scientific mainstream. Was it really that hard to find a geologist, activist, or middle schooler who paid attention in science class?